BBC Radio 2 presenter Aled Jones featured Sacred Land on his Sunday Morning programme, which reaches some eight million listeners. “Lovely Martin Palmer has been a guest on the programme on a number of occasions,” Jones said . “He’s got a new book out next month called Sacred Land which shows how to de-code the British landscape and discover the ancient maps which are hidden in our modern cities. Sounds absolutely fascinating.” He continued to say that the book was inspired after a conversation Martin had with a Russian Orthodox priest. “Sounds like a cracker,” he concluded. 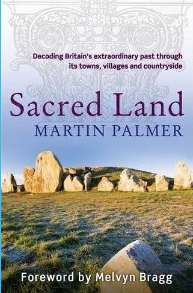 The Telegraph published a large article by Martin Palmer in the Easter Saturday Weekend section, based on his book Sacred Land detailing 10 places you can visit in the UK, showing the Easter story, including the yew in Scotland said to be the birthplace of Pontius Pilate, and the place where Joseph of Arimathea is said to have come to Britain as a missionary. Link hereto see the places and photos. “The reason I wrote the book Sacred Land was to help people to discover what lies just beneath the surface. We’re very good at looking at what’s there, but it just takes a little bit of imagination and a slightly different angle, and you can see beneath what we’ve put up in the 20th century, layers and layers and layers that tell very different stories.” Link here to read the full interview with Venue‘s Mike White. In a major interview in the Ecologist, Martin Palmer tells Tom Levitt how we can learn from previous manmade ecological collapses in Britain and create a ‘new narrative’ that challenges our dominant consumer culture. THE ECOLOGIST: In your book you talk quite a lot about the devastating impact humans have on the natural world. Do you think that humans can live sustainably? MARTIN PALMER: Throughout most of recorded history we have actually managed to have a balanced relationship with nature. What happens though is that we become more and more grandiose, for example building vast complexes like Stonehenge and destroying every other stone circle for 150 miles around it. We centralise our power and push ourselves and we push nature beyond a sustainable model. In other words, we exhaust the soil, we cut down most of the forests, we put pollute much of the air and the water and we become dependent on such extended trade routes that even the most minor ecological change actually destroys our ability to function because we become dependent on a lifestyle that is supported by grandioseness and no longer a simple relationship with nature. THE ECOLOGIST: Are we a vulnerable species or can we now engineer a solution to any future ecological crisis? MARTIN PALMER: I think one of the great teachings of all the major faiths in their scripts and of all the greats is hubris. Hubris is essentially being so proud that you can’t see the fall that is coming. And I think a great deal of our assumptions about how we’re going to deal with the future is in fact hubris. You know, if we just wait another ten years we’ll sort out how to capture carbon etc. I think the fundamental problem is that we are coming at nature as managers, not as part of nature, and if I look back over those four great collapses, what I note at each stage is that the collapse is proceeded by what appears to be a sense that we are in control. Our existence, our ability to sustain, is only possible if we actually understand that we are part of nature. And the theological perspective comes from this: when you’ve got a sort of triangle of the divine, however you understand that to be, ­ nature, and ourselves, then humanity is not able to place itself at the centre of the universe. There is always a bigger story at the centre of the universe: ­ the gods, the creation, whatever creation means. Every time we lose sight, if you like, of our place within something bigger and think its all for us, that’s when the collapse comes…….